Tuesday, November 27, 2018 at 5:30 pm. Light Up a Life is our yearly non-religious celebration of remembrance and gratitude featuring tree lighting, refreshments, live music, and a reading of names of those who have passed and those we cherish still with us. This will be a joyful gathering expressing our gratitude for lives well-lived and love shared. The names are read aloud as candles are lit in their honor. Names to be read aloud can be submitted via donation envelope, or by contacting us by phone or email before November 23 at (541) 322-2165, events@friendsofhospiceoregon.org. Light Up a Life is held at Partners In Care. It is open to the public, free of charge. Every year we offer a special keepsake ornament. This year’s ornament is a holiday tree in a window frame. Ornaments are available for a suggested donation of $25 each and can be mailed to you or made available for pick-up at Partners In Care. Purchase of an ornament is not required to submit a name for reading at the service. 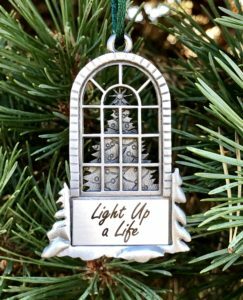 Keepsake ornament: This holiday tree in a window frame represents the core tradition of our annual Light Up a Life service, the lighting of the tree. It is printed with the words, Light Up a Life and comes with a green cord for hanging. This ornament measures 1 3/4″ W x 2 5/8″L. Please call Makayla Oliver, Development Officer, Partners In Care, at (541) 322-2165 to inquire about Light Up A Life. You may also order your ornament(s) by mail: LUAL Donation Form (PDF) or online. Keepsake ornaments are available for mailing or pick-up throughout the year. We do have a selection of previous year’s ornaments if you are interested, contact Makayla.